Admittedly, I didn't expect much when I first put this CD into my stereo. Thoughts of disjointed songs that don't sound like a true "band" effort went through my head. Also, I expected that the man would have to be spreading himself too thin. Could he really handle all songwriting, sing, deliver quality power chords, riffs, solos, bass, and handle drum duties to a high level? Also, could he really produce and mix this album to a respectable level? The skeptic in me said that one man could not handle so many areas at a high enough level. For the most part, my doubts were quickly dashed when I popped this album into my stereo. I suppose that many people would have doubts such as mine prior to listening to an album from a one man band. After all, how long did Tom Scholtz keep his secret from the world regarding Boston? Aside from Brad Delp (vocals), Boston was essentially Tom Scoltz. Had that fact been known at the time, would the debut and Don't Look Back be the classics that they are today? That's very debatable at the very least. With the power of the internet today, it is possible to check out sounds samples and read reviews of albums prior to investing in the album. With that said, it is easier for artists like Steve Cone to represent themselves at face value and let their music speak for itself. The music on Distortion certainly does speak for itself in a positive way. If you like hard edged melodic metal in the old school, 1980's vein, you should get to know this album. From the opening track, The Gambler, to the very end, Distortion is a surprisingly solid and consistent album. The songs are all guitar based, with a steady offering of power chords and chugging riffs carrying the songs. As I alluded to above, all the instruments blend together very well, very much like a band effort. Steve also colors the songs with a tasteful, but not overindulgent amount of shredding. You'll get a bit of the "guitar hero" feel from the dazzling guitar work offered on Distortion, but in no way does this facet of the sound overshadow the songs as a whole. Furthermore, the solos and shreds never come across as simple, egotistical "showing off." Close attention was obviously taken to ensure that each of the songs would be able to stand on their own as a foot stomping, melodic metal anthem. Steve's songwriting is a mature combination of heaviness and melody. An emphasis is placed on hard hitting guitar work, with most of the songs featuring heavy riffs and power chords. A few songs vary from that formula, such as the slow and plodding Alive, the slow but dark Understand, and the ultra groovy I Have the Right. In any case, each of the songs incorporates a sense of melody that does not compromise heaviness or go over the top in terms of sing-a-long chorus lines. Still, each and every one of the songs on Distortion is catchy in its own rite, and different from the other tracks. The arrangements vary enough from song to song such that the album never becomes repetitive or predictable. Also, the rhythm section (Steve on drums and Steve on bass) does a very commendable job. The bass keeps up very well with the fluttering lead guitars, providing a solid bottom end for a well rounded sound. Also, the drumming is varied, but energetic and very tight throughout the album. This combination provides a very solid backbone to Distortion's sound. While I am largely impressed with this album, I'd be remiss not to mention areas in which I think improvement could be made. Steve has proven his great abilities with the guitars and drums. Writing a fourteen track album without any filler is quite a feat too; I have to hand it to Steve as a songwriter as well. However, I do think Steve'e vocals are the weakest area of his repertoire, but they are definitely not bad. He reminds me a lot of most NWOBHM vocalists; serviceable, but not of the same quality as the instrumental performances or the song arrangements. He has a limited range, and seems to struggle in certain spots when holding a note for an extended period. There are also spots on the album in which Steve's delivery sounds thin and too nasal. This isn't a prevailing theme, but it does bear mentioning. On the positive side, Steve's vocals are as energetic as his guitar playing. Also, he does a fine job accentuating the melodic moments of the music with his voice. Steve also harmonizes the vocals over a significant portion of the album, which masks the aforementioned vocal shortcomings extremely well. While not nearly the force behind the mic as he is with the axe or behind the drum kit, Steve is a serviceable vocalist who makes the most of his vocals, particularly when harmonizing the vocals on this album. The production on Distortion is a bit rough, but you have to give a release like this a lot of leeway in this area. I do find the production extremely good for a self-financed effort. Still, it is obvious that this is not a big budget release. The guitars are a bit muddy in spots, and the drums aren't as crisp as I'd like them to be. Again, I feel that Steve did the best job he possible could with the resources available to him. The mixing is perfect, with no element of the sound drowned out, or overpowering any other elements. Despite the lack of crispness, Steve still creates a heavy and powerful sound. As I said, for a small budget, the production here is more than I ever would have counted on. All in all, Distortion is a surprisingly strong release from this one man warrior of heavy metal. 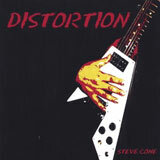 If you like old school heavy metal, especially NWOBHM, you should really visit Steve's website (linked at the top of the review) and learn more. Give this man a record deal and a bigger recording budget, and I'm confident that he can bump up the quality of the final product even more!